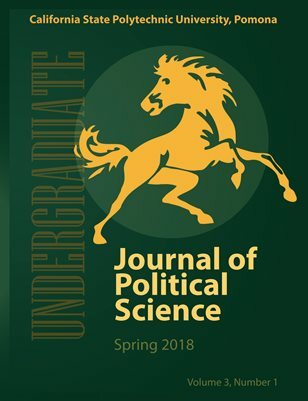 The third issue of the Undergraduate Journal of Political Science, published by the Department of Political Science at California State Polytechnic University, Pomona. Volume 3, Number 1, Spring 2018. This issue features “Wildlife Trafficking” by Joshua Ebiner, “Fighting Corruption” by Thomas Genova, “Ethnic Conflict” by Laura Yeghiazaryan, “Black Public Identity” by Tristen Marler, “Immigration: States Vs. Feds” by Ingrid Flores, “Civil Liberties on Campus” by Trevor Samaha, “Title IX: Dear Colleague” by Athenamarie Garcia-Gunn, “Title IX: Michigan State” by Gustavo Callejas, and “The Supreme Court: Are Lawyers Necessary?” by Kristen Khair. Special thanks to Editor-in-Chief Kristen Khair, Production Designer Jane Pojawa and Faculty Advisor Dr. Neil S. Chaturvedi. © 2018 All rights reserved.